Mix marinade ingredients together, and combine with meat in a resealable plastic bag, squeezing out all the air inside the bag before sealing. Set this in refrigerator for at least 2 hours so flavors can be absorbed. Turn the bag occasionally so that the marinade gets absorbed on both sides. Preheat a heavy skillet, preferably cast-iron on high heat for about 10-15 minutes. Make sure that it is as hot as it can get before cooking. Meanwhile, remove meat from marinate, making sure to get it as dry as possible (reserve the marinate for cooking veggies with). Sear the meat under the burning hot skillet for about 1.5 minutes on each side. Then, continue cooking under low heat. The amount of time is dependent on how you want your steak and how thick it is. My steak was about 1.5 inches thick. I cooked mine for about 8 minutes (about 11 minutes total including the cooking time during the searing process) and it came out perfectly medium rare. 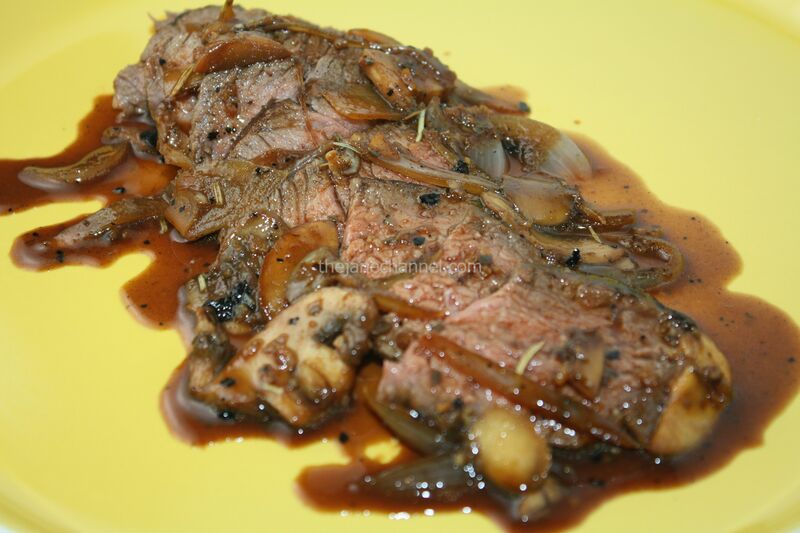 London Broil is a meat that will be very tough if overcooked, so make sure not to overdo it! Using the same skillet, add a bit of oil and cook mushrooms and onions, scraping up the brown bits in the skillet. When mushrooms and onions are almost cooked through, add in excess marinate. Cook until the sauce has reduced somewhat and is the appropriate consistency. Slice the steak thinly across the grain. Pour the mushroom and onion sauce over it and serve.